After seeing reports on the spate of fires at black churches, I had to wonder: is this really atypical? After all, this is a huge country with hundreds of thousands of churches, and there are a lot of fires every summer. I was surprised that only ONE news outlet, The Atlantic, bothered to even attempt to contextualize the fires with data – and they did a rather perfunctory job of it. Everyone else wrote rather terrifying narratives that seemed to assert that a wave of terrorist attacks is sweeping the South. I would rather that narrative be wrong. I think you would, too. I think we all would rather live in a country where people don’t senselessly kill and terrorize each other and burn down each other’s places of worship because they can’t get along. And I had an inkling – call it cautious optimism – that we as a nation are BETTER than some folks in the media assert that we are. I just have to think that we are not THAT utterly depraved as a society. So I did some research. And some math. It is estimated that there are about 70,000 black churches in the US out of 350,000 churches nationwide, or around 20% of the total. Not surprising, since African Americans are the most religious racial group and the churches themselves tend to have a small and familial character. If we assume that predominantly-black churches catch fire at the same rate as other churches (which is arguably optimistic, given that black churches are more likely to be poorly built or maintained due to differences in wealth between racial communities), and if we assume fires are evenly distributed throughout the year – they are not; in fact this week, the week of Independence Day, is FAR and away the worst week of the year for fires – then based on these numbers alone, fires will occur at 13.6 black churches in a two week period ([0.20*1780]/26). The most recent available report that I could find list fires at six black churches in the past two weeks. So this is not merely a typical fortnight; it is, in fact, better than average. investigators have found no evidence of criminal intent. Again, as per the NFPA data, there are 280 cases of arson at churches in a typical year. So making the same assumptions (black churches are targets for arson at the same rate as other churches, arson is distributed evenly throughout the year), we can assume that an INTENTIONAL fire will occur at two black churches in a typical two week period ([0.20*280]/26). The data says we should expect arson at two churches. We have conclusive evidence of arson at…two churches. In other words, this is, by the perverse metric of church arson, an entirely average two weeks. Obviously, there are two investigations still ongoing. It may be the case that three or four churches were set ablaze. But with such a (thankfully) small sample size and such a (thankfully) rare event, we cannot rationally make the conclusions to which the media has already leapt until the arsonists are caught and their motives made known. I have also seen some reporting outlets, including the Washington Post, include fires at white churches in their reporting – including one which was struck by lighting – in order to say that seven or eight churches had burned. Including these wholly unrelated and likely innocuous incidents at white churches is poor journalism and borders on scaremongering, plain and simple. I am not in any way trying to discount the fact that racial hatred is a motivating factor behind fires at black churches. In fact, the NFPA report itself states that a disproportionate number – one in three – of intentionally-set fires occur at black churches (although 37% of these fires are started by black arsonists). 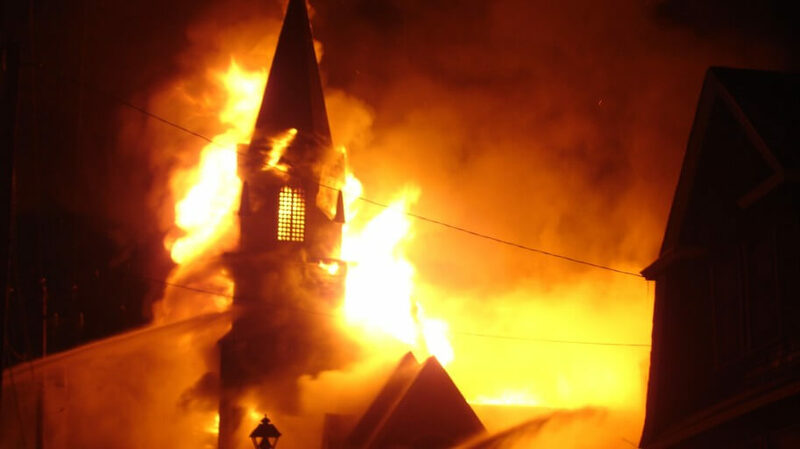 The NFPA also reports that 58% of those arrested in church arsons were “motivated by bias.” The burning of black churches has been and continues to be a very real problem, and we as a nation have to do something about it. These are not difficult questions to answer. The data is right there for anybody to access. Anybody, that is, except reporters with ad space to sell. It’s important for anybody who truly supports a freer and more equal society to fact-check the media and wait for official conclusions to be reached before we raise Cain, lest we develop a “boy who cried wolf” situation. I’m reminded of the media hyperbole surrounding Antonio Martin’s shooting. Yahoo News ran the headline “Police shoot black teen at Missouri gas station,” and pointed out the proximity of the event to Ferguson. Twitter went nuts, people went out to protest in the streets – and then a surveillance video was released showing that Martin had robbed the gas station and pulled a gun on the cop. Thanks to the media (and activists) linking this with the ongoing narrative of police corruption in the minds of the public before all the facts were out, the wholly legitimate complaints of people who had to live under a pretty corrupt system in Ferguson lost some of their legitimacy in many people’s eyes. People cared less, political will dissipated, etc. Now, it’s entirely possible – even probable, that one or both of the arsonists this week DID act out of racial hatred or in response to some of the disgusting events of the past weeks. Whoever they are and whatever their reasons, I hope they are brought to justice swiftly. And if hate was a factor here, I’m hoping that they are punished to the fullest extent of the law. Nobody doubts that have a lot of work to do to in patching up racial relations in our country. But what’s patently untrue is the media’s initial portrait of a massive and growing wave of terrorist attacks on black churches. Alex Hyder was born and raised in the DC metro area, although he has spent enough time in Honolulu to consider it a second home. He studied engineering at the University of Maryland. He loves data-driven realpolitik, getting his hands dirty tinkering with anything electrical or mechanical, acting in local theater, and Richard M. Nixon. You can catch him in Silver Spring Stage’s one-act productions of “House Rules” and “Broken,” August 27-30. Shark attacks and child kidnappings are both things in the past where the media could not stop talking about it but the events involved were no worse than typical. Basically, the media fixate on a narrative for a news cycle. Another story pops onto the scene and everyone forgets. I think maybe Dan Ariely wrote some about a typical human problem is misjudging the frequency of events to the point we get scared over normal and unlikely to affect us. Probably some others in the behavioral economics realm also cover it.